Believe it or not, I missed the Olympic 800 meters in the stadium, and I didn’t even watch it on TV. Why? Because I was attending a private coaching clinic with Jessica Ennis, Toni Minichiello and Mick Hill. I’ll be posting that 60 minute interview shortly on this Blog, so stay tuned. One of the reasons why I collect splits for the sprints and hurdles is to find the sweet spot for ideal race pace. What do you need to do in TRAINING to accomplish this? Now, I wasn’t at the stadium, so I’m relying on second hand information. I think we all know David Rudisha WAS the rabbit in this race as opposed to the other races. Quite an incredible feat! I’ve always used the double plus 10 seconds rule to determine the potential of a 400m sprinter moving up to the 800 meters with the proper training. As you can see from the splits above, the sweet spot between the 2 laps is anywhere from 2.5 to 4 seconds. Each body is different because every trains differently. One of these days I’ll have to interview Wynn Gmitroski. If I ask you to run the first lap in 50 seconds and your PB is 50, you’ll be in a world of hurt at 500 meters. If it’s 46, then you should be okay. What that means is you need all 3 types of pace training at the 400, 800 and 1500 meter levels. Hence 3 track sessions a week, each one with specific goals. Speed, race pace, and endurance/strength. You need that speed reserve for the first lap, so the faster your PB, the easier it will feel when it’s 3 or 4 seconds slower. You still have to do the aerobic and lactate training, though. 800 meter Training Weekly Cycle (and Video slideshow) This gives an example on how to setup 13 training sessions in a week. Peter Snell Training with Arthur Lydiard famous training methods. Definitely a long to short program! Steve Ovett Training: Again, definitely a long to short program and quite a contrast to Seb Coe. Scott Christensen Training Videos. This is worth a look for the High School and Junior College coaches, as he follows a similar philosophy as me. 800 meter training by William Wuyke. 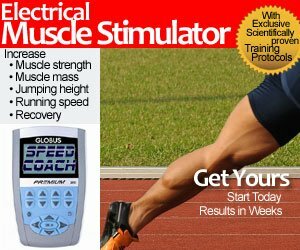 This is a classic article with over 30 comments with full workouts and annual plans. How Much mileage should a 800 meter run? The classic question to prevent overtraining and burnout. Sample 800m workout: The Breakdown Here is my performance indicator chart that breaks down one of tracks classic workout. Looks easier on paper. I’ve made an article about Rudisha two days ago. In these could be seen his progress around the years. In another article can be seen more data of this great athlete. Other two articles develop more data about Rudisha before his world record. thanks for your support! i need the full training schedulde for 800m under 18 category pls could you help me? @Ashley Long, multi-eventer like in Decathlon/Pentathlon, or multi-eventer as in multi-sport? We have no real idea of the process of running 800m, what we should be aiming to achieve or how to approach training for the event. Should the 1st lap / 2nd lap pace differential of 2.5 – 4.0 second rule be increased for those that run in 2:00 to 3:00 range for 800m? 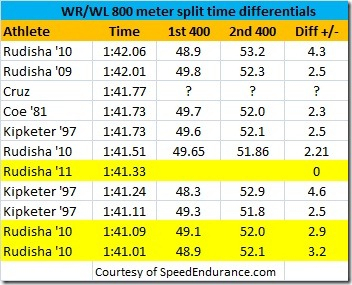 For example the average differential on your chart is 2.94 seconds including Rudisha’s 2.35 which wasn’t on the chart. On a percentage basis this translates to an average differential of 2.9% for these same 10 race times which if applied to a youth running a 3:00 800m would result in a pace differential of 5.2 seconds. So is it unrealistic to expect this same stringent standard across the board regardless of ability? @Patrick, yes, those numbers are for elite athletes. Taking percentages is best for slower times. Thanks for pointing that out.